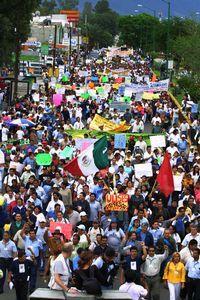 About 3 1/2 weeks ago, some 5000 or so teachers from throughout the state arrived and set up camp in the zócalo in Oaxaca. The zócalo is the main square in the center of the city and is a tourist magnet, or at least it was. The coffin the marching teachers are carrying here says, "Rest in Peace, Ulises Ruiz Ortiz". That would be the governor of the state. All of the public school teachers from throughout the state, some 70,000 of them, walked off the job leaving some 1 million kids with no school and only 6 weeks left in the school year. As the days went by, more and more teachers arrived, especially on the weekends, to augment the original 5000 or so. They pitched tents in the zócalo, set up a half dozen porta-potties, cooking installations and just generally settled into about 50 square blocks in and around the center of the city. This effectively shut down the tourist trade in Oaxaca. And believe me, tourism is all this place has got. Initially, all of the downtown businesses closed up. But, after a few days, the restaurants, pharmacies, markets and other stores reopened and began to attract business from the thousands of people camped out on their doorsteps. That would prove to be a big mistake. They brought their kids along, too -- after all, there was no school. The sign says, "Honest students help the teachers". Last week, they blocked the entrance to the airport and shut it down for a day. 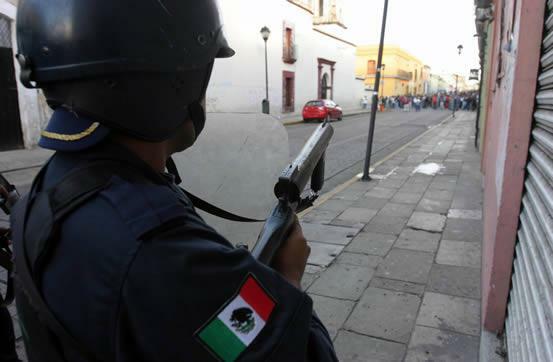 This forced President Vicente Fox to threaten to send in federal troops to keep the airport open. He said later that the reason he didn't send in troops immediately to remove the teachers was that there were no troops in the area. Very strange, since there is a military installation (fort) here and one can see soldiers moving in and out of the city almost every day. Hmmm. Last Saturday, the teachers' union was joined by every special interest group that one could name, swelling their ranks to between 80,000 and 120,000, depending upon which account one reads. They marched about 5 km from the Benito Juarez memorial statue, which is on the east edge of the city, all the way back to the zócalo. The various groups spray painted windows and walls of businesses and homes with various threats and slogans as they marched. Meanwhile, during the time they spent camped out in the zócalo, they managed to rip out all of the newly installed parking meters, destroy the decorative barricades that block off the two pedestrian-only promenades and destroy thousands of freshly planted flowers and the shrubbery in the newly refurbished zócalo. I would suppose that, prior to today, they've done $100,000 or so in physical damage. They also sent round-the clock contingents out to the last toll booth on the main highway into and out of the city to the northwest and blocked the toll takers from accepting tolls from motorists, trucks and buses. 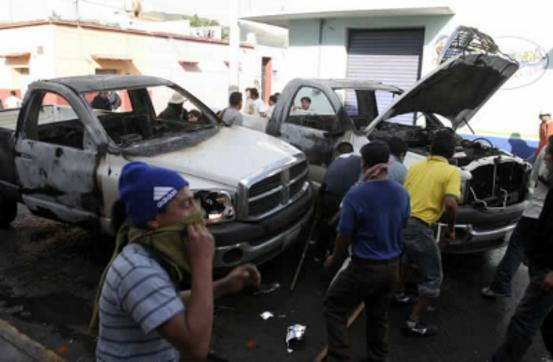 The federal government estimated these losses at 1.5 million pesos, or about $130,000. Each day they would pick a different target. The weekend before last they blocked the entrance to the two shopping malls as well as store entrances therein. Sears, the two big movie theaters and Fábricas de Francia (high-end department store) were all shut down as well as every gas station within a mile or so of the city center. I needed to go to Arrazola for more photos of alebrijes for my online store but could not. Another day they blocked all of the Gigante supermarkets. Another day Sam's Club was the target. And on and on. The merchants had no choice but to close up shop and wait until the teachers left. 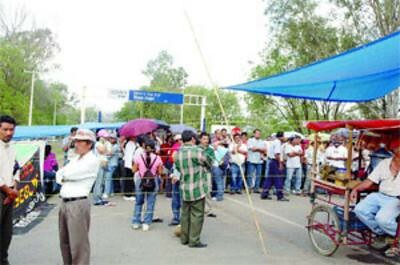 President Fox did send about 1500 additional police who camped in a town about 25 km from the city. They had been there about a week while awaiting instructions. Late yesterday, they received them. At 4:00 this morning 3000 police officers attacked the city center. Initially, the coordinated police action went well. Most of the teachers were routed by teargas. Here a lone teacher facing 5 cops with only a club looks around for some help. 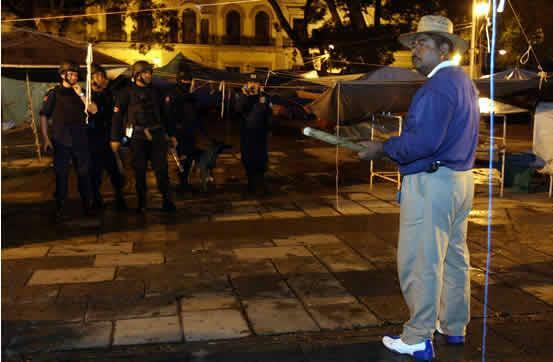 As dawn broke, the police had control of the zócalo. Those are the tents, tarps and sleeping bags of the teachers that you see burning. Victory, however short-lived. Look at his gas mask. A real campfire in the zocalo. 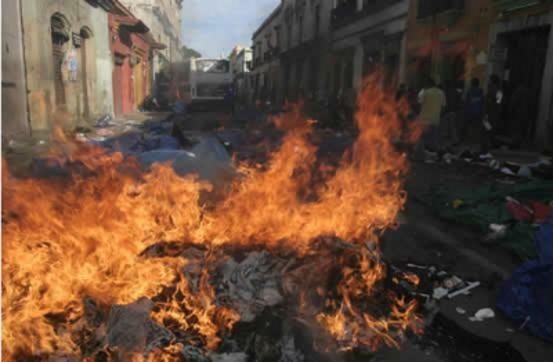 Those are tents, tarps, clothing, furniture and other belongings of the teachers burning. 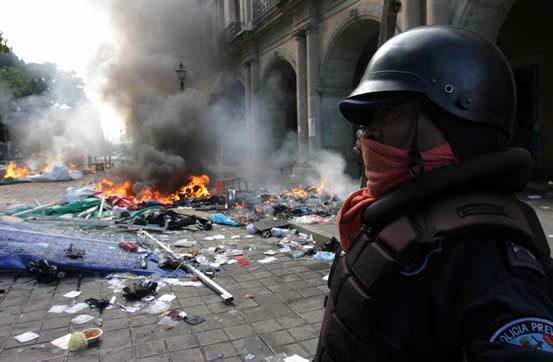 Teachers' barricades burning on one of the side streets leading to the zócalo. If you look towards the top of the photo, you will see a city bus trapped between the teachers and the police. That bus will be burned by the teachers. Then the police made a beeeg mistake, IMHO. They had control of the city's center and then sat there and awaited a counterattack. Look at the mob gathering at the end of the street. 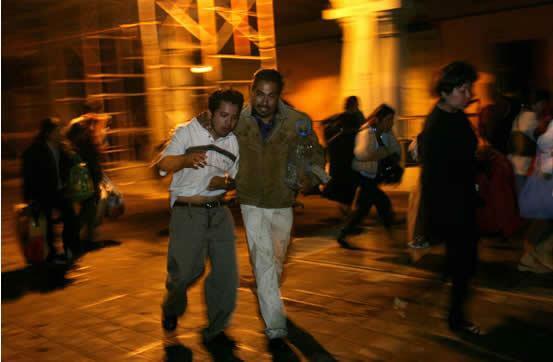 This was occuring at the end of every street all around the zócalo and the now-trapped police forces. The counterattack begins at about 9:00 AM. Look at the guy's sweatshirt there on the left. That is not me. 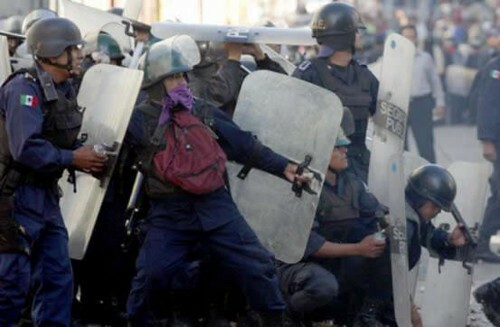 The teachers counterattacked with some 10-15,000 bodies against the force of 3000 policemen trying to hold the city's center. I might add here that most of the police were not armed with anything more than nightsticks and Billy clubs. Does the name Custer ring a bell? Here the teachers hurl rocks and return teargas cannisters from behind two burned out pickup trucks. I would guess that the trucks belonged to the teachers. The police are under a full frontal assault and beginning to lose ground. These guys are hurling teargas cannisters and it looks like they are in an old British square. You know, "Front rank, fire! ", Front rank kneel! ", "Second rank, fire! ", etc. Except, the British had muskets. It's over. The teachers have regained control of Oaxaca and the police have withdrawn to areas some 7 or 8 blocks on every side away from the downtown. Now then, there have been reports of at least two teachers killed as well as one child but I don't think that has been confirmed by anyone. The local newspaper, Noticias, which has itself been at war with the governor for at least a year, is reporting that a local hospital has confirmed one adult male dead. The authorities are also reporting that the teachers have struck out at the downtown merchants who had been so kindly catering to them. 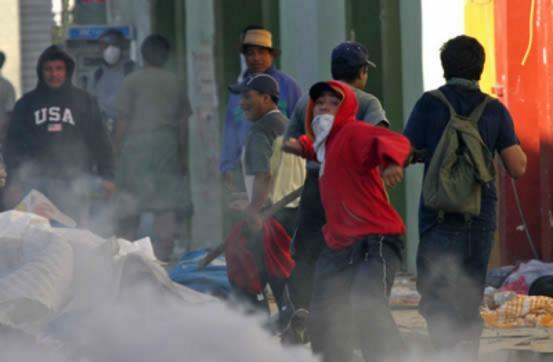 They have allegedly broken into shops, stores, restaurants, the central markets (there are two big ones just south of the zócalo) and several hotels and are walking off with everything and destroying everything that they cannot carry. They also reportedly commandeered a big city bus and drove it into the zócalo and smashed it into the class hotel which sits beside the cathedral. Again, no confirmation because there ain't nobody left in the downtown except teachers. I know that this is a gigantic post, but you need to understand what is happening here. I think that Mexico, after all of the decades of suppresion, dictators, corruption, murder, theft, failed revolutions, failed reform governments and , generally, all-around failure, is on the brink of explosion. I'm not going to take sides here, just try to lay out for you what has led to this bloody confrontation which, as you can see, is far from over. The teachers are demanding a 100% pay raise. They are demanding that governor Ruiz step down. They are demanding money be spent in the countryside for schools where children cannot afford a pair of shoes, let alone books, utensils and uniforms. They are demanding that the schools in the countryside, many of which are tin-roofed shacks, be updated with at least the bare minimum of accomodations, like windows, blackboards, desks and chairs for the poor indian kids. And they are right. 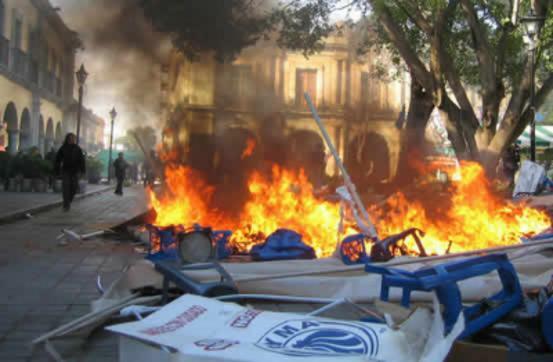 Destroying the center of Oaxaca and its tourist trade is, however, pretty stupid. From where, exactly, do they expect the money to come? On the other hand, the authorities were probably right to try to retake the city. But the government should have realized that a failure such as has occurred would be worse than no attempt at all. 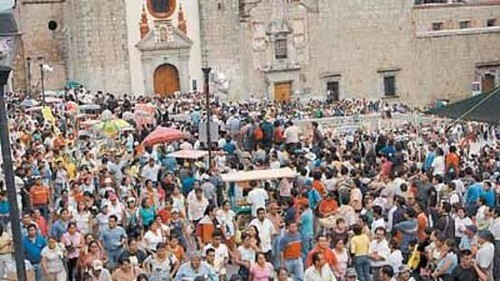 The teachers, however, have watched as the government of Governor Ruiz has spent, in the past year alone, some $200,000,000 USD to remodel the zócalo and many other historical sites (unfinished) in and around the city, the Guelaguetza amphitheater (unfinished) where the world famous festval is due to start, uh, next month, the main drag into the city from the north (unfinished), and a myriad of other public works projects, most unfinished and almost exclusively here in the capitol city. The teachers see little or nothing being spent in the outlying areas of the state where money is so desperately needed. The money being spent is courtesy of ya'll up there and $75 per barrel PEMEX oil. Visit this Guelaguetza website and then ask yourself if these unfortunate people are not just whistling Dixie. 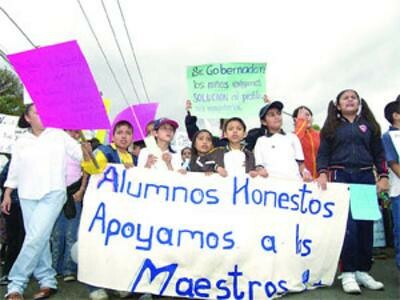 In addition, the teachers, as well as a whole host of others, charge that the many projects are not finished because Governor Ruiz and the PRI have siphoned off some $8,000,000 USD to aid the presidential campaign of Roberto Madrazo. What makes this alleged theft of public monies so egregious is that Madrazo is doomed to a poor, third-place finish for a party that had ruled Mexico for 71 consecutive years, until Vicente Fox and the PAN party finally knocked them out of the presidency in 2000. 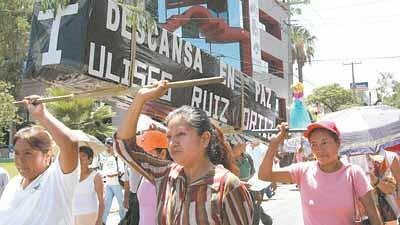 The 2006 election is scheduled for July 2, just two weeks away, and the teachers have vowed that no voting will take place in Oaxaca de Juarez, the capitol city of the state of Oaxaca. If that happens, it will provoke a constitutional crisis regarding the legitimacy of a national election in which an entire state capitol did not take part. 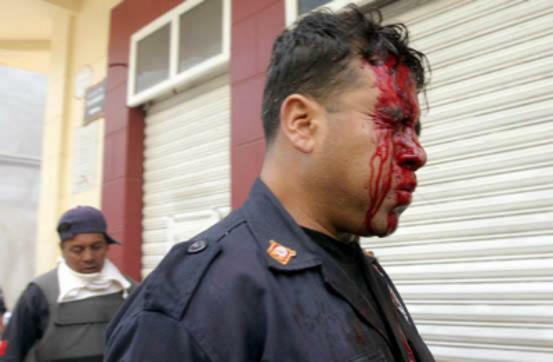 All this comes after, for all intents and purposes, 480 years of repression by the Spanish, the French, various Mexican born and bred dictators and, for the last 200 years, the teachers charge, the caciques and then the PRI. Caciques (kuh-SEE-case) is the term used to describe the wealthy landowners and businessmen who control most of the country and almost all of the wealth. Some caciques here as well as in many other parts of the country run their own goon squads and death squads. Supposedly, caciquismo was to have been ended by the 1910 revolution. If you read this blog you know how that went. The winners all ended up shot dead. 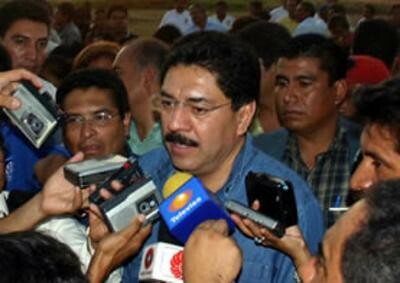 Madero, Pino Suarez, the brothers Flores Magon, the brothers Serdan, Zapata, Villa and Carranza, all shot dead. Every one. And they were the winners. The EZLN (Zapatista National Liberation Army) under the command of the masked comedian Subcomandante Marcos down in Chiapas is a joke. They have done absolutely nothing to improve the lot of the dirt poor peoples of that state. Fifty thousand teachers joined by 30,000-70,000 supporters is a whole different ballgame, however. If the teachers hold out and a significant number of their supporters of the last couple of weeks return here to help them, this country is in big trouble. I see only two options to end this quickly. Fox and the army have to take over this state and any other state if this blows up elsewhere. They'll have to take control of the government(s) and, most especially, the money. I don't see that happening. The national legislature is not under Fox's control. They would crucify him. I don't think the army would support him. The second option would be that Governor Ruiz is forced to resign. I'm not sure that would work because a replacement from the PRI would have to be named. The only way this works is if the teachers and other interested groups are consulted in the choice. I don't see this happening, either. It would take another century for all the various interest groups to ever agree on a replacement, if by then. What a mess. But it is a mess well deserved by everybody on both sides. It's the same thing in the USA. We gripe and complain about our governments, but we're the ones who voted them into office. The Mexican people have permitted their own subjugation by an ever-changing cast of characters for 5 centuries and have yet to do anything about it. And don't start barking at me about how the powerful white Europeans from Spain defeated the noble indians. It didn't happen like that, at all. The last time the Mexicans successfully deposed an errant leader was when an indian picked up a rock and beaned his own emperor, Moctezuma, killing him and sending Cortez scurrying out of Aztec territory. And that lasted for only about two years. As has been the lot of the Mexicans doing it to themselves first before it could be done to them by others, when Cortez returned two years later he was at the head of the largest army ever assembled in history up to that time, some 350,000 fighters. Of those 350,000, only about 1500-1800 were Spanish soldiers. The rest were Mexican indians from Tlaxcala, Texcoco and many others who joined up along the way who had a bone to pick with the doomed Aztecs and their last emperor, Cuauhtemoc (kwah-TAY-mock). And the Mexicans are doing it to themselves again, this time right here in Oaxaca.